I’m not sure why it’s got such different names in English and French. I like to think that it originated with Chinese shepherds and so we’ve both got it right. Either way, it’s one of my favorite examples of cold-weather comfort food, and one of the easiest to throw together. My recipe is really simple, and I will eventually start tweaking it to add different seasonings and vegetables, but for now it’s still appreciated every time I make it so I hesitate to play with it. Peel, chop, and boil up the potatoes for mashing. Then, obviously, mash them. Use milk or cream, whatever you like better, but definitely toss in some butter. Everything is yummier with butter. Dice the onion and fry it up in some butter (see – yummier! ), set it aside. Brown some ground beef in a pan. The amount is up to you – I used about a pound of it because that’s what I had. Season the meat with salt and pepper, and when it’s all done, mix a couple teaspoons of powdered beef gravy with about a 1/4 cup of water and stir it into the meat. Mix the onion back in. Pour the meat into a baking dish*. Spread it around to get a nice even layer. Add the two cans of corn and spread that around. Use a big spoon to plop a scoop of mashed potatoes every couple inches across the top of the corn – you can’t really spread very well because the corn is squishy and you’ll make a mess, so the trick is to use smaller scoops of potatoes and try to cover a lot of surface with well-placed blobs. Then you spread the tops of the blobs so they all connect, leaving you with a smooth potatoey surface. Which you can then poke at with various utensils to make it look pretty (I used a fork and made lines). It’s important to spread the potatoes to the edges to “seal” everything, otherwise you’ll get meat juice bubbling up and it might make a mess. Into the oven for about 30 min at 350. The top of the potatoes should get the slightest bit brown and will be firm when you poke at it. And when you scoop some out to eat it, it will be delicious. *I used an oval Corningware casserole dish, but a lasagna pan would work pretty well too. 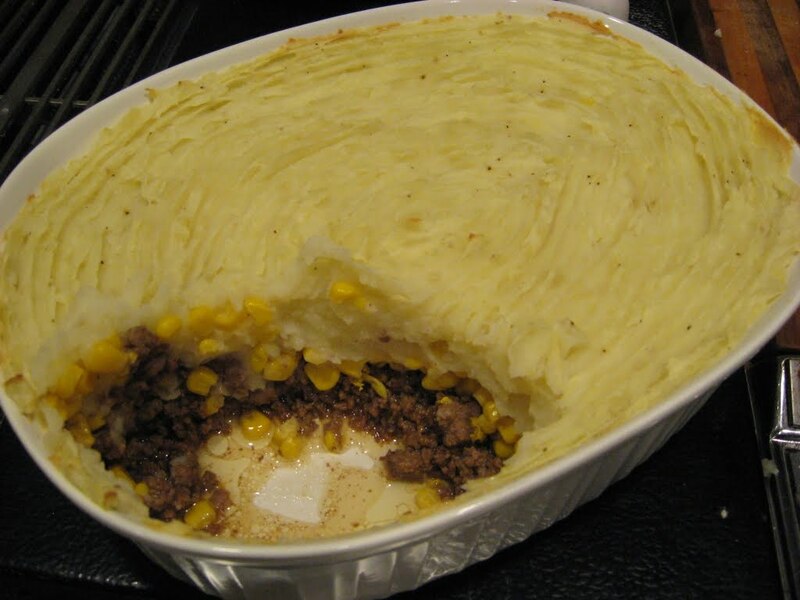 I like my shepherd’s pie to be thick, as opposed to all spread out in a flatter pan, so I usually use smaller dishes with higher sides. If you’re using a flatter one, check the oven often, because you won’t need to leave it in as long. going to try it this week Jen! Looks Awesome!